Q: Can you explain me what are these devices for? A: They are listening devices. They are used to listen remotely to a conversation or activity in a place without the knowledge of the people in this place. Q: And why should I listen to any activity in a room? A: There are many reasons: getting private information about your spouse / mate, children, business, crime, violence, security and so on. It also may save elder or disabled people from violence, emergency situation or even death. A: Usually, you need only one receiver and one transmitter, or as we call them “listening devices, bugs, hidden microphones”. There are cases when you may need more than one transmitter. It is very simple to use them; you need to insert a battery, turn the transmitter on, conceal it if required, and this is all. Then, turning on the receiver, you can listen wirelessly even to the slightest sound, even to a whisper, from distance. You can connect a recorder to the receiver and record the activity, or listen in real time, from distance. Q: What is the distance I can listen to these microphones? A: There are various listening devices, and they have various output power. However, the output power is not the only factor that has influence on distance… The distance of ANY transmitter is very difficult to predict. It may vary from 50m and up to 5000m and depends on many factors as: thickness of the walls, the height of the building, (this is the most important factor), if there are obstacles between the receiver and transmitter or it is a straight line (line of sight - LOS), the composition of the walls (how much iron is in reinforced concrete), the freshness of the battery (it must be alkaline or Lithium), its antenna, the height of the place where is the receiver, other radio stations vicinity, cell-phones / routers, repeaters and antennas, the transmitter's position in the room, underground pipes, mains transformers (underground or on pillars), and the sensitivity of the receiver, the output transmitter’s stage (amplified or not, buffered or not), weather, night or day and other factors. A: Right! If we compare two transmitters, placed in an ideal place, one has 10mW and the second one 70mW, of course that the distance is longer by using the 70mW device. However, as an example, many taxi drivers use transmitters for communicating with the taxi station or other taxi drivers. They may communicate from long distances, and usually, their transmitters have an output power of 30-35 Watts. They may do it just by using repeaters on high buildings, and long antennas. Without the repeaters, the high power transmitters could be used only for short distance communication and are useless. A: A quartz crystal is – in our case – a component in the transmitter. It is in use for stabilizing the transmitter or receiver frequency. It is exactly as the one used in large transmitters, which allow you to find your favorite radio stations, always on the same place at your radio dial. Q: What is a VOX? What is it good for? A: A VOX is a listening device with voice activation. Usually, when there is a quiet place, it remains in “standby” mode, not transmitting and drawing just a minor current from the battery. As soon as there is a noise / sound / speech around it, it begins to transmit. Are you interested to waste battery power when no one is at home, or during sleeping time? Of course not! Therefore, using a VOX device, it may double or even triple the transmitting time! Q: …And if I cannot change batteries frequently? A: We have several transmitters that are connected directly to the mains (110-120V). They are not using any batteries, and work forever. Q: Why aren’t you offering GSM based devices? Q: Why aren’t you selling video cameras? A: Video cameras are devices that we prefer not selling. The reason is: if the camera can “see” the target, I mean the person(s), the persons can see the camera. There are various types of cameras, for better and worse, but even if they are hidden in various appliances, they still have to use lens which point to the target. Usually, persons that are doing something wrong, illegal or even cheating, are a little bit suspicious… they will check if something is changed in their place, added, moved etc., and as you cannot hide the lens – it is just a matter of time up to revealing the cameras. Q: What about payment and shipping? A: We accept PayPal or Western Union. 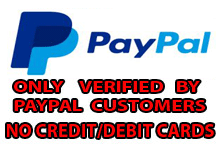 However, we accept PayPal only from verified by PayPal customers, and not accept payments via PayPal using credit or debit cards. As well, the address must be confirmed by PayPal, not a P.O.Box or similar. We are also verified by PayPal, and we provide the most secure way to give our customers the entire peace of mind. Usually, we ship within 24-48 hours from payment. If you may have any additional questions, we will be happy to help and assist you.